Autumn is harvest time, and there has been much in the news about how the heatwave of summer 2018 has affected arable farming. Wheat harvests came early, but salad crops suffered from the lack of water. We are better protected from food shortages and weather anomalies than our ancestors, but the weather still has a huge impact on this vital aspect of the economy. Agriculture has always been an important industry in the United Kingdom, with arable and horticultural (i.e. crop) farming employing hundreds of thousands of people. It uses 20% of the UK’s total land mass, but is particularly concentrated in the East and East Midlands. 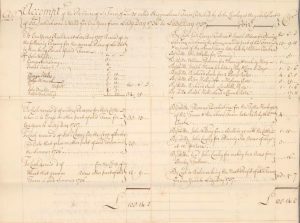 This account of receipts and expenditure on Higgenslane Farm is for the year up to Lady Day 1737 is from an estate account and rental for the manor of Dracklow and Rudheath, Cheshire. 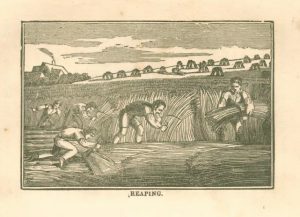 It includes entries for rents, expenditure on seed, ploughing and sowing, fencing, mowing and haymaking, rates, tithes, and workmen’s wages. Lady Day, 25th March, was New Year’s Day until Britain adopted the Gregorian calendar in 1752. This is why the British tax year starts on the 6th April (i.e. Lady Day plus the two weeks ‘lost’ when the calendars changed). Agriculture suffered a depression in the inter-war years due to the impact of World War One on the economy, as prices rose and wages fell. For the first time, the majority of British millionaires were not landowning aristocrats but businessmen and investors. 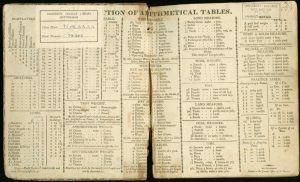 This printed table of currency, weights and measures is from the inside cover of a memoranda book for a farm in the Stragglethorpe, Holme Pierrepont and Cotgrave area, Nottinghamshire. It was intended to be a handy reference guide, and with the baffling array of units of measurements it is easy to see why even the most adept tradesman or farmer might need prompting. The barley corn – literally the length of three grains of barley, approximately 1/3 of an inch or 0.8cm – was still a fundamental unit of measurement in 1814 but today survives mainly as the basis for shoe sizes in English-speaking countries. Also, note the multiplication tables peeking out from under the old library label, for those who never quite managed to learn their times tables by heart. 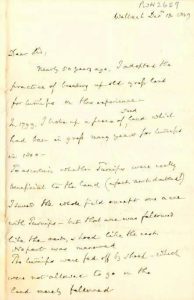 The volume was used as a journal of agricultural activities. From internal evidence, the farm was a sheep farm, and it also produced the arable crops barley, corn, wheat, oats, grass, hay, turnips, swedes, potatoes and beans, many of which were probably grown for fodder. 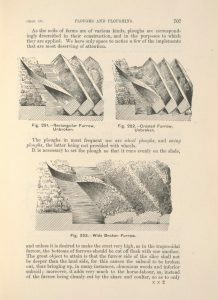 These illustrations show how the soil is turned over in a regular unbroken furrow, a crested unbroken furrow, and a wide broken furrow. In the Middle Ages, an acre was the area of land that could be ploughed in one day by a yoke of oxen, and thus varied depending on the landscape. Later it was standardised to 1/640 square mile. As it only ceased to be a standard unit of measurement in the UK in 1995, the vast majority of historical land records will refer to land in acres. There are very few images in books from the 17th century, as the printing technology available made it a tricky and time-consuming process. 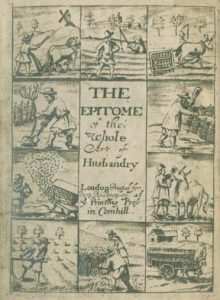 Title pages were the exception, and this one shows ten agricultural illustrations relating to planting, harvesting and animal care. Many books, guides and manuals were published intended to provide advice, although the farming techniques and equipment was still quite primitive. They proved very popular, as the majority of the population was employed in agriculture, and would be until the Industrial Revolution. Agricultural labour was hard manual labour until mechanisation became widespread in the 20th century. This volume combines descriptions of the weather, the insects, birds and wildlife to be seen, and the farmers’ tasks, with poetry. Wheat, as is being harvested in the image, was and remains the most widely grown and most valuable crop in the UK, with just over 13.2 million metric tons produced in 2012. Crop rotation is important to help the soil recover after the harvest and to avoid a build-up of disease. Many 19th century farmers adopted a four-field system of rotation (wheat, turnips, barley, then clover). One such proponent was William Cavendish-Scott-Bentinck, 4th Duke of Portland (1768-1854) who took a great interest in agricultural innovation on his vast estates. 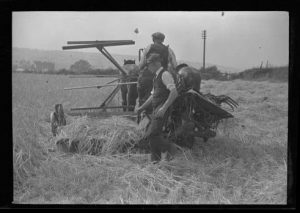 He advocated growing turnips instead of leaving land fallow for a year, claiming that almost twice as much barley was produced the next year. The University of Nottingham and its predecessor colleges have taught agriculture and farming since the 1890s. 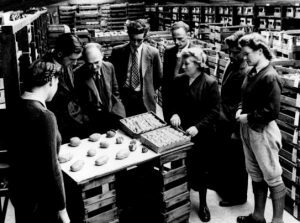 Amongst this group inspecting potatoes is Nora McDermott, lecturer at School of Agriculture. She was dubbed the ‘Potato Queen’ for her extensive knowledge of potatoes. The examples come from documents and rare books held by Manuscripts & Special Collections at The University of Nottingham. Our collections relate to the University and the wider East Midlands, including businesses. For more information visit nottingham.ac.uk/mss, follow us @mssUniNott or read our newsletter Discover.